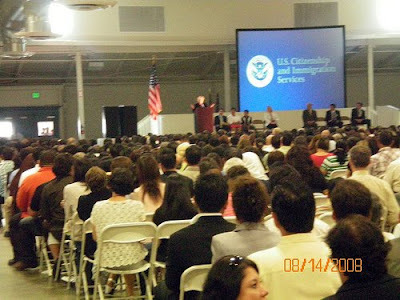 Zoe Lofgren addressing new citizens at a Oath Ceremony in San Jose. On that day, more than 3000 people became US citizens! Today, the House of Representative's Subcommittee on Immigration, Citizenship, Refugees, Border Security, and International Law is holding a public hearing on the Ethical Imperative for Reform of our Immigration System. The subcommitee chairman is Zoe Lofgren (D) (CA 16) who represents south San Jose, home to vibrant Vietnamese- and Hispanic-American immigrant comunities. Good luck with the hearings! You can checkout a YahooNews photo gallery of the hearing. I will post more info as it becomes available. James R. Edwards, Jr., Ph.D.